Legal 500 has released a new magazine called “Fivehundred”. The online publication, available to read for free online, features a wide range of good quality articles. You have interviews with prominent law firm managing partners such as Brad Karp of Paul Weiss and Stephen Poor of Seyfarth Shaw plus commentary from other legal industry figures such as former Debevoise & Plimpton marketing director Yolanda Cartusciello, and recruitment and legal technology experts. There’s a good spread of international coverage, and many of the Legal 500 editors weigh in with features and analysis on the legal markets in their own parts of the world. Alongside the larger jurisdictions like the US and UK, there is coverage of law firms in Australia, Singapore, India, and less well-known markets like Ecuador and Malaysia. As Fivehundred is a product from the Legal 500 family, the analyses of the legal markets in various countries reference firms’ relative performance in Legal 500 and the articles contain links to the relevant directory rankings for that practice or country. One good aspect of the in-depth ranking features is a look back at how firms have fared over the years in the directories, such as in the report on the Swedish market. John van de Luit Drummond’s piece on what young lawyers can do to build up a market profile and get published is good. At 227 pages long, it’s on the weighty side – I’m not sure if Legal 500 can produce this much content every month – but there’s a lot in here, and it’s an impressive new product. Fivehundred is set to publish ten times a year, and is available as an online interactive flipbook, and via a new app. 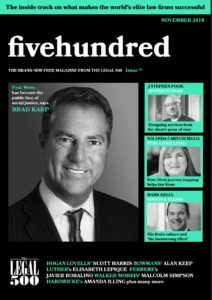 Share the post "Fivehundred – The New Legal 500 Magazine"